In 1979, Kevin was introduced by his neighbour, Simon, to ‘Challenge walking on The Malvern’s Mid Summer Marathon’, a 35 mile circuit taking in the full Malvern ridge, to be completed in 12 hours. They finished in 11 hours 26 minutes and despite the blistered feet, Kevin was hooked. The pain was soon forgotten and Kevin signed up for the Bullock Smithy Hike in the September of the same year. 56 miles in 24 hours around the northern part of the Peak District. Walking through the night was made more difficult with the heavy rain but Kevin completed his second challenge in 22 hours 17 minutes. By 1981, Kevin had completed several more ultra-distance challenges and felt ready for the Long Distance Walkers Association (LDWA)100 mile challenge which was to be held, for the first time, in the Lake District. Kevin remembers “All more or less went to plan up to breakfast at 60 miles. The heavy rain and poor visibility throughout the night made navigation difficult and slowed me down. Then after leaving the breakfast stop, I felt a sharp pain in my right knee but I was determined to finish so just slowed down. The weather on the second night was as bad as the first and I started to hallucinate, seeing things that were not there”. Kevin’s first 100 mile challenge took him 43 hours 10 minutes and to date he has completed another 15 (and 3 DNFs) with the quickest in 1988 which was the White Peak 100 in 25 hours 41 minutes. Kevin decided he need to get fitter so after the first ‘100”, he bought some trainers and started to run with his Yarnfield neighbours Simon and Tony from their homes to Norton Bridge round-a-bout and back. Kevin remembers, “Tony made it to the Meece Road T junction and sat down to await our return. Simon and I made it back to the house in a collapsed state to the amusement of the ladies”. The majority of Kevin’s training was off road but a year later, in 1982 he entered his first road race, The Eccleshall 15 which he completed in 1:50:31. He was fortunate to train with work colleagues, during his lunch break and continued to improve his times on the challenge events so decided to enter his first marathon in 1983, the Wolverhampton Marathon. Kevin explains, “the distance was not a problem, but could I run 26.2 miles on the road without stopping? I set myself a 6:30 pace and held it for 20 miles, then slowed to finish in 2:53:35”. 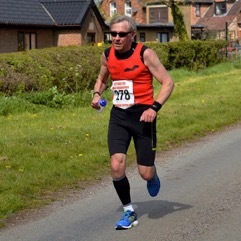 In 1987, Kevin left Stafford AC and rather than join the newly formed Stafford Harriers he waited for his 40th birthday and after completing the required 5 training runs, joined Stone Master Marathoners as a veteran. In 1988, Kev ran a distance of 57 miles as part of a fundraising drive for Children In Need organised by British Telecom’s training college where Kev worked. He started from the BT training school in Shirley, Birmingham and followed the tow paths of the Worcester, Birmingham and Staffordshire canals. He came off the canal and ran through Stafford, Great Bridgeford and Norton Bridge before arriving back at the college 9 hours and 17 minutes after starting out. In 1996, Kevin was invited, along with other local veteran runners to take part in the Stafford Classic 1 mile race. 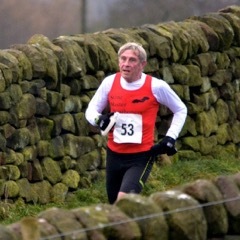 Being more used to the longer distances and never raced anything less than 5 miles, Kevin recalls, “It was scary! Several laps of Stafford town centre at full pelt. Time 5 minutes 17 seconds. Hardly time to get warmed up”. Kevin’s wife, Margaret underwent major breast surgery in December 1999 at the North Staffs Hospital. Kevin decided to raise sponsorship on the 2001 London Marathon for the hospital. 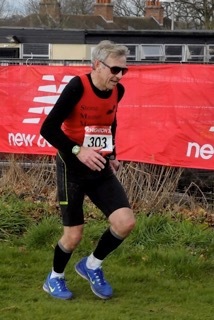 He explained “I needed a ‘good for age’ time so I gained a late entry in the Manchester Marathon. Despite many obstacles on the day I ran it in 2:56:49 which was good enough to qualify for London. Fortunately, it was one of those races where everything went to plan and I finished in 2:50:15. 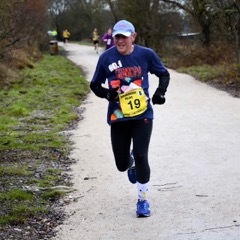 12th in the V50 age group and we raised £1,500 which Margaret was able to give to the Wards that had given her another chance”. “Not completing a challenge is always disappointing. Not once, but twice, stopping 5 miles short of a 100 mile challenge because of blisters is frustrating to say the least”. Since joining SMM in 1997, Kev has always felt privileged to run with the ‘Bat’ on his back. He explains, “the solid image of the flying fox gives me strength and determination. I’ve been asked a number of times about the Bat and the motto underneath it, ‘Sapientia atque levitas’ which roughly translates means ‘wisdom and lightness of heart’ although I think of it as ‘light of heart, fleet of foot’ when the race gets tough. From first joining the Club, I’ve enjoyed ‘mustering back’ for the slower runners whilst training and staying with them to the muster point before setting off at my own pace again. As I slow down I now appreciate the faster members coming back for me”. In 1988, Kev took up the role of Membership Secretary for the LDWA, standing down after 5 years. He went on to serve on the Club’s Committee in the early 1990s as the editor of the Club’s magazine ‘Sapientia’ . Vernon Olivant joined the Club about a year after Kevin and like Kevin loved the LDWA’s challenge events. In 2000 Vernon formed his Stupid Heroes League Similar to the NSRRA principle (i.e best 10 races out of 20) but focusing on ultra-distance multi-terrain challenges, Kev worked closely with him for about 5 years until his untimely death in 2005. With help from other Heroes, he kept the League going for another 5 years. Plan ahead, but don’t set your targets too high. Be flexible. This is your hobby, not your job. Family and work commitments take priority. Take advice, but remember, what suits one person, may not suit you. Gather together a number of training schedules and build your own which takes into account your ability and work/home life commitments. When things go wrong, be it in a race or when out training, do not worry. We all have ‘off’ days. Think back. What were you doing? What had you eaten? Do you have stress from work or family pressures? These can all affect your performance. Make a note. Written or mental and learn from it. I’m often asked about injuries but apart from blisters, I’ve only had one, a torn calf after the 2014 Flying Fox Marathon which stopped me training for 4 weeks. It may be because I started in the late 1990s as a walker and I still prefer ‘off road’ but long multi-terrain events or training builds stamina and exercises more parts of the body but is easier on the joints.